The Humble Bundle is back! That's right, here's another chance to pay peanuts for a handful of amazing games. For those that don't know, The Humble Bundle is a sale that comes along once in a while with a bundle of games or books or whatever their selling at the time, and you can pay whatever you want! Donate above the average amount, and you unlock a couple of additional products. You can choose where your money goes, whether it's to various charities, the game developers, or directly to The Humble Bundle, to support future bundles. from developer Deep Silver. 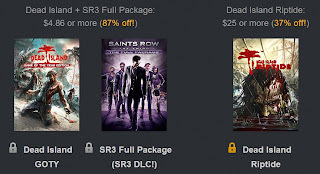 Included in the pack is Saints Row 2, Saints Row: The Third, Risen Waters and Sacred 2 Gold. If you choose to pay above the average price, you will also receive Dead Island GOTY edition, and the full Saints Row: The Third DLC package. But wait, there's more! Paying over $25 will also unlock Dead Island Riptide. Visit The Humble Bundle website now!